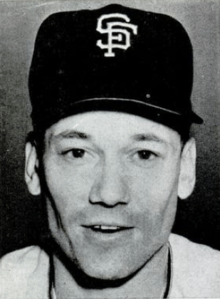 Stuart Leonard "Stu" Miller (December 26, 1927 – January 4, 2015) was a pitcher in Major League Baseball who played for the St. Louis Cardinals (1952–56), Philadelphia Phillies (1956), New York/San Francisco Giants (1957–62), Baltimore Orioles (1963–67) and Atlanta Braves (1968). He batted and threw right-handed. In a 16-season career, Miller posted a 105–103 record with a 3.24 earned run average, 1164 strikeouts, and 154 saves in 704 games pitched (93 as a starter). On April 30, 1967, Steve Barber and Miller combined to pitch a no-hitter for the Orioles against the Detroit Tigers, but would lose 2–1 because of a wild pitch and an error allowing two runs to score in the ninth inning. Miller was involved in one of the more memorable moments in All Star Game history, albeit for an exaggeration of the event in question. In the ninth inning of the first of two 1961 All Star Games (two were played between 1959 and 1962), which was played at Candlestick Park, a gust of wind caused Miller to sway slightly, resulting in a balk, which advanced Roger Maris to second and Al Kaline to third. In the embellished version, it is reported that the wind gust blew the 165-pound Miller off the pitcher's mound. Kaline later scored on an error by Ken Boyer on Rocky Colavito's ground ball, which tied the score at 3–3. One batter later, the wind caused catcher Smoky Burgess to drop Tony Kubek's foul pop-up for an error. Miller bailed Burgess out by striking out Kubek, and after Yogi Berra reached base on Don Zimmer's error, Miller got Hoyt Wilhelm to fly out to left to end the inning. In the top of the 10th inning, the defense behind Miller almost did him in; Nellie Fox walked and scored all the way from first on Boyer's three-base throwing error (the second by Boyer in as many innings) on Kaline's ground ball. Miller's teammates bailed him out in the bottom of the inning and made him the winning pitcher; Hank Aaron singled and scored on a double by Miller's Giant teammate Willie Mays to tie the score, then Mays scored the winning run on Roberto Clemente's single. On May 14, 1967, he gave up Mickey Mantle's 500th career home run. Miller died January 4, 2015, at his home in Cameron Park, California, aged 87 after a brief illness. ↑ "Apr 30, 1967, Tigers at Orioles Play by Play and Box Score". Baseball-Reference.com. Retrieved January 5, 2015. ↑ "National League 5, American League 4: All-Star Game Played on Tuesday, July 11, 1961 (D) at Candlestick Park". Retrosheet. July 11, 1961. Retrieved January 5, 2015. ↑ "Former Giants pitcher Stu Miller dies". ESPN. Associated Press. January 5, 2015. Retrieved January 5, 2015. Klingaman, Mike (July 14, 2009). "Catching Up With...former Oriole Stu Miller". The Toy Department (blog). The Baltimore Sun. Parnass, Larry (September 12–13, 2015). "Northampton baseball field to be dedicated to major leaguer Stu Miller". Cities & Towns. Daily Hampshire Gazette. Northampton, Massachusetts. p. B1. Retrieved September 13, 2015. (subscription required (help)). Szlosek, Rich (September 5, 2014). "Rich Szlosek: The Northampton ballplayer who went far: Stu Miller". Daily Hampshire Gazette. Northampton, Massachusetts. Retrieved September 13, 2015. (subscription required (help)).